Flower pots are probably the most common object found in a garden. Every gardener has used them at some point, and at the very least we can appreciate how useful these little plant holders can be! They allow for flowers or choice plants to be easily moved around, and can also make taking care of your plant a lot simpler! Change the monotony of having the same planters in your garden. 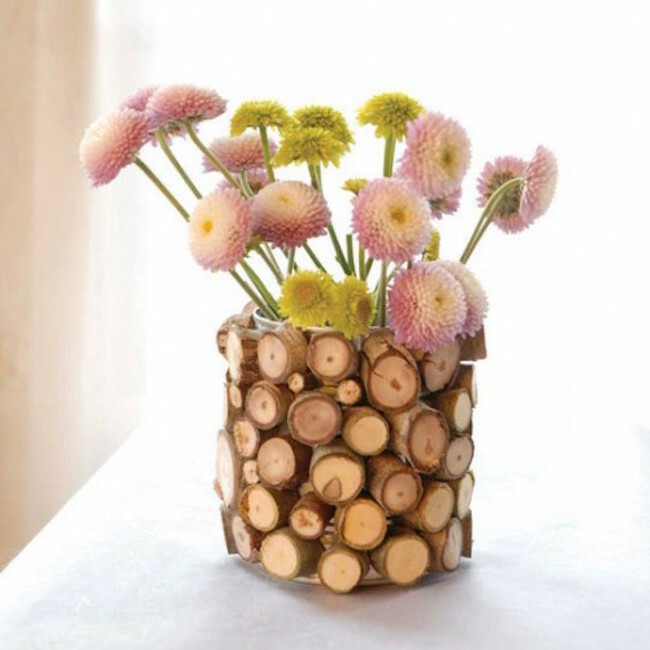 With these flower pot decoration ideas you can change things up a bit. Whether using ceramic, plastic, stone, or even fabric planter bags, they are an easy thing to customize, and are a great way to add some character and personal touch to your garden! Because they are so common, flower pots can easily become a bland and boring decoration. Everyone has seen them and everyone is used to the popular styles, but thankfully, we have creativity on our side! Take a look at these examples we have gathered of some flower pot decoration ideas, and get some inspiration to turn your own flower pots into artistic creations! 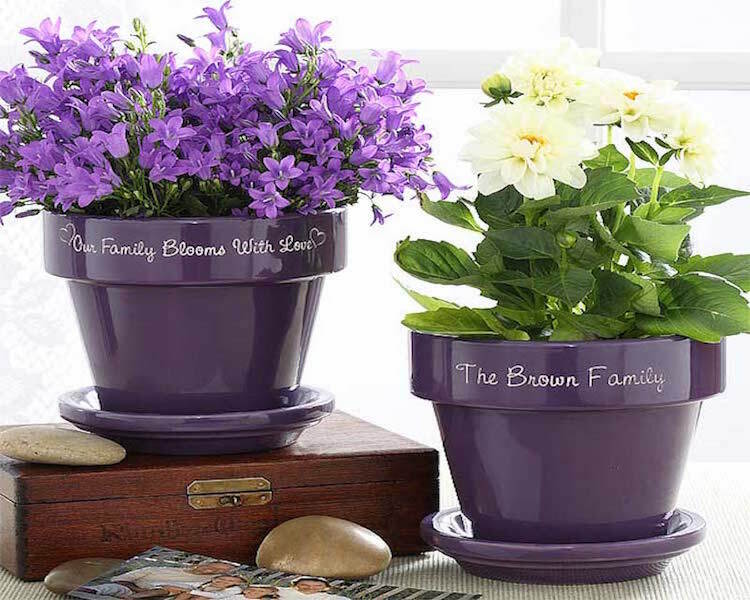 Take this traditional route and use a steady hand to paint the family name on your flower pots! These hand painted flower pots are a great idea for a garden in the front yard or somewhere close to an entryway. Use an additional pot and paint a quote or saying on it to add that extra personal touch. This example may not be the most artistic or stylish, but it certainly is a creative idea! Use any flower pot with a large visible surface to paint on your home address! 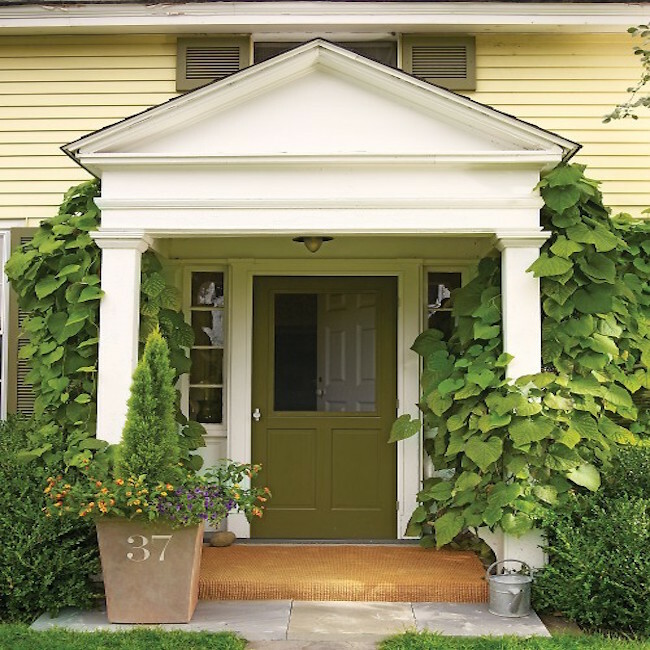 Its a unique way to display your home number, and also allows for a nice plant to grow in front of the house. These glass beads are great for all kinds of crafts, so its no surprise that they work well when decorating flower pots too! These little glass stones can easily be glued in different patterns around a flower pot to create a multitude of different looks! 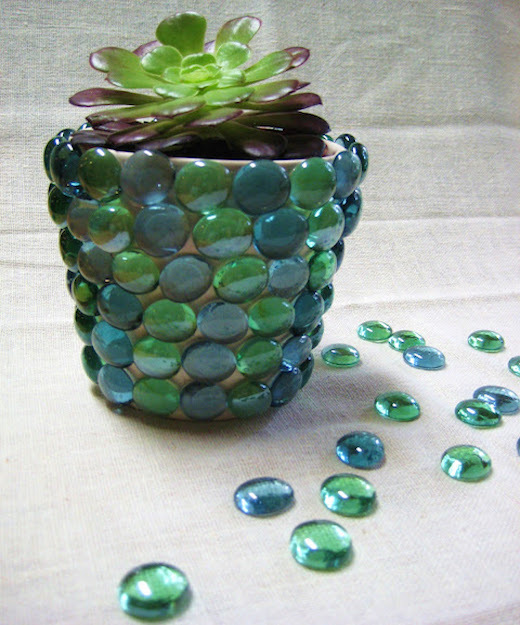 If you have an old broken flower pot, you can actually use it to create this design! Paint the chips of the old pot and then position them in any pattern that you desire around a new pot. 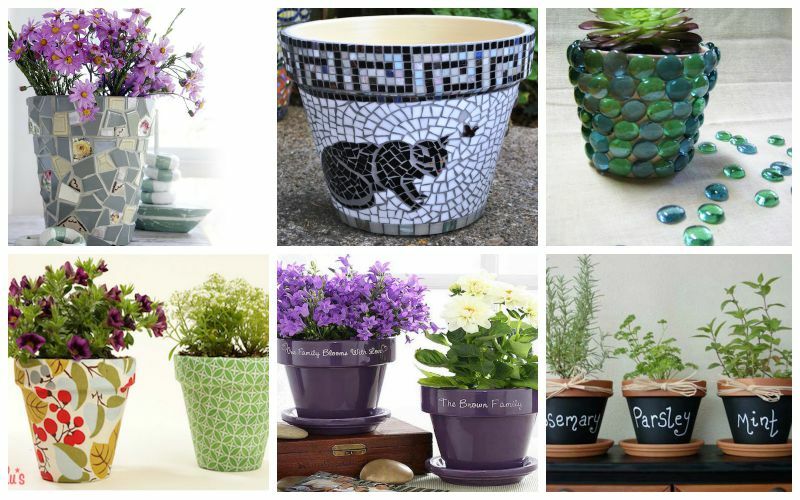 Simply use a sealant to hold them all in place and you have a brand new and stylish flower pot! Similar to a traditional mosaic design, this pot is covered in different shapes and sizes of seashells. This design is a light and simple one, yet it is unique and quite creative! 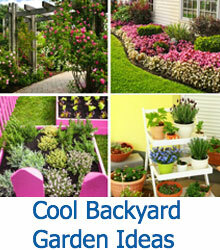 A great addition to your garden if you live near a lakeshore or ocean. Any regular old ceramic flower pot can simply be painted black and turned into a useable chalk board! 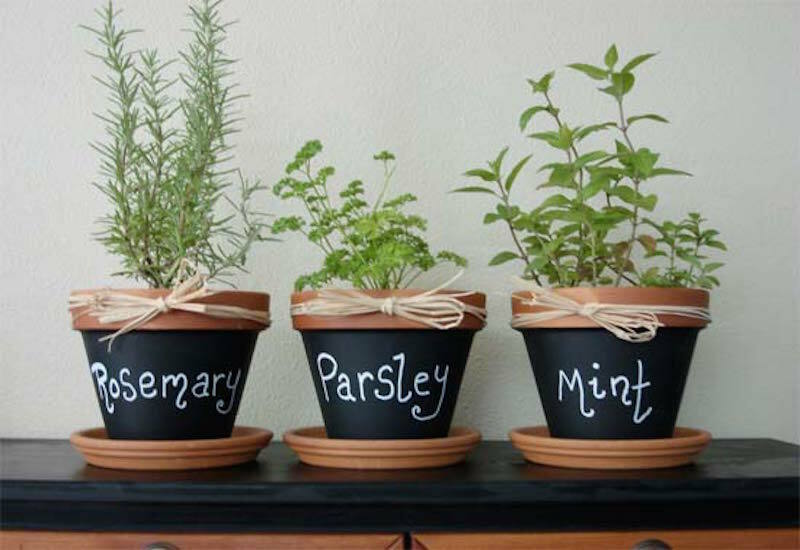 Like these examples here, this is a great way to plant herbs and spices and label them in a fun and unique way. Using chalk also allows for the pot to be re-used and re-labeled depending on what you decide to grow next! 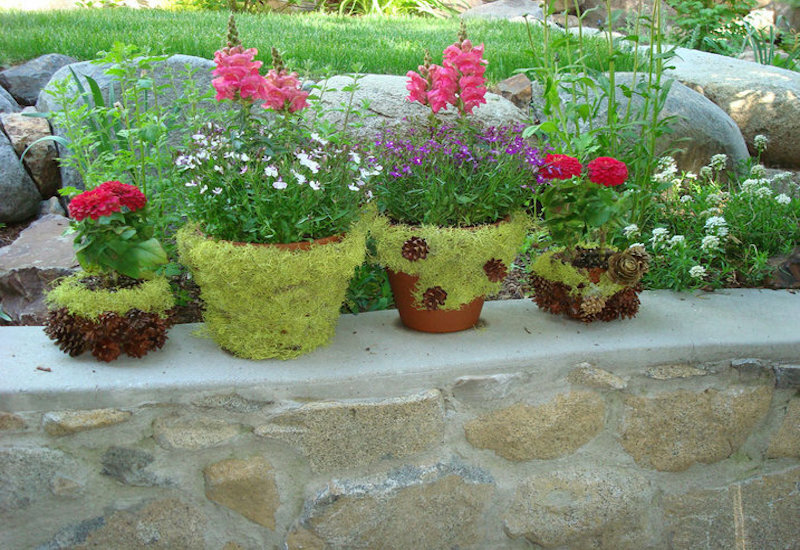 A wonderful idea for the more woodsy natural types, this design consists of moss and pinecones covering the outside of the flower pots. If you live in a forest area and have a lot of moss growing around you, you can use real moss and simply replace it when it dries up, or just use imitation moss to get the same effect with less maintenance! These pots are a designers pride and joy! They look great and are actually pretty simple to make. Just use an adhesive on the outside of the pot, and apply it as you tightly wrap the fabric around the entire outer surface. 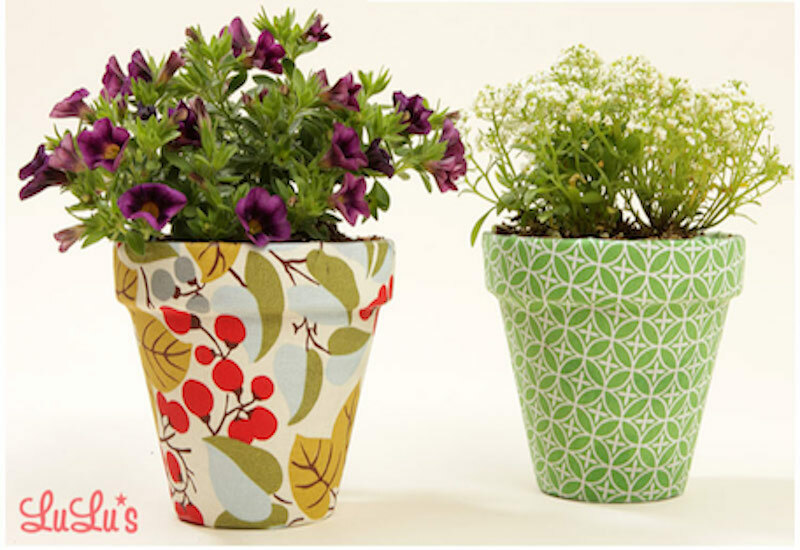 The results are these stylish and inventive flower pots! 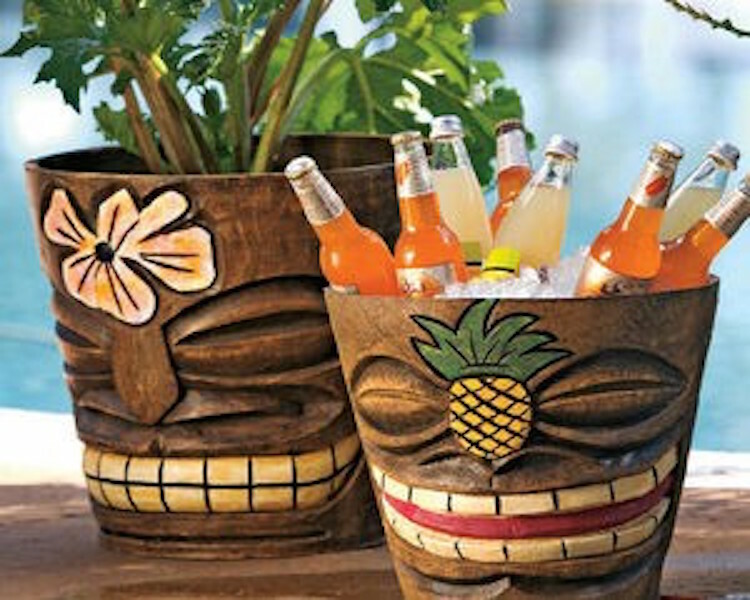 Branching out from strictly using pots for flowers, these tiki head pots serve as a great bucket for ice and drinks! 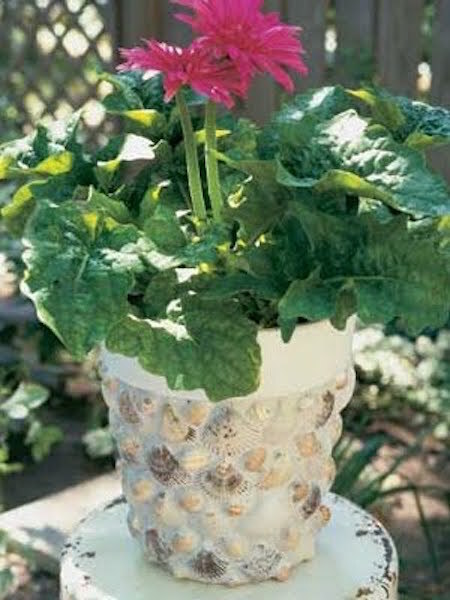 Simply by washing out a used flower pot, you can turn it into a similar design. 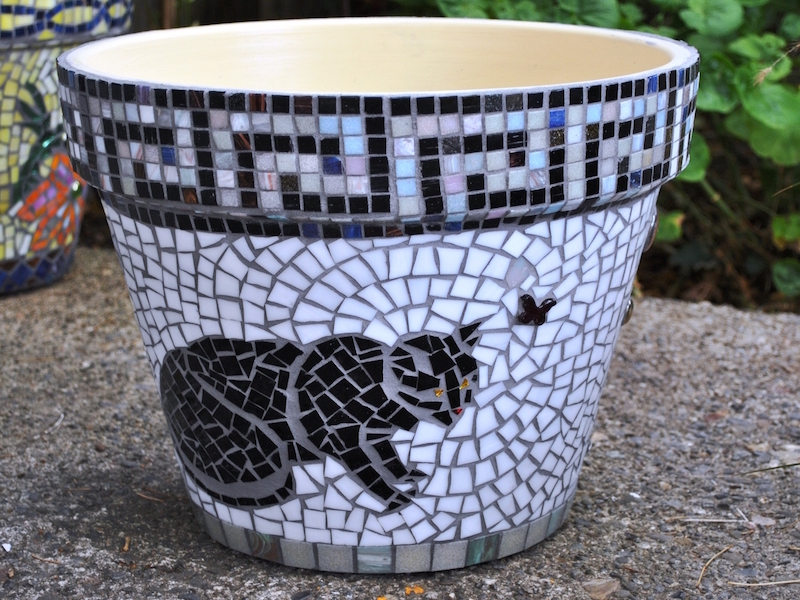 You want to get as much use out of your pots as possible, especially if you put a lot of time into decorating it. Again, flower pots don’t always have to be used for flowers. Using them as decorative pieces go far beyond just painting the outer surface and planting something inside. 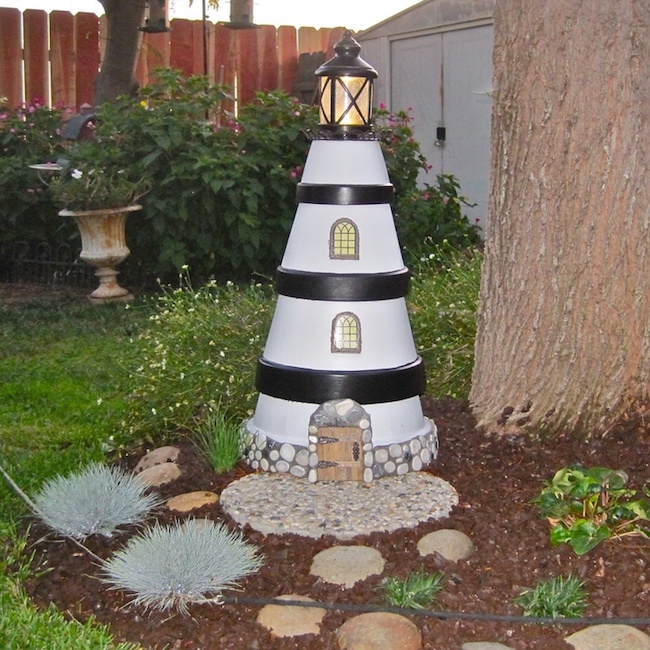 Here, we have upside down pots stacked on top of each other and then painted to form this handsome lighthouse! 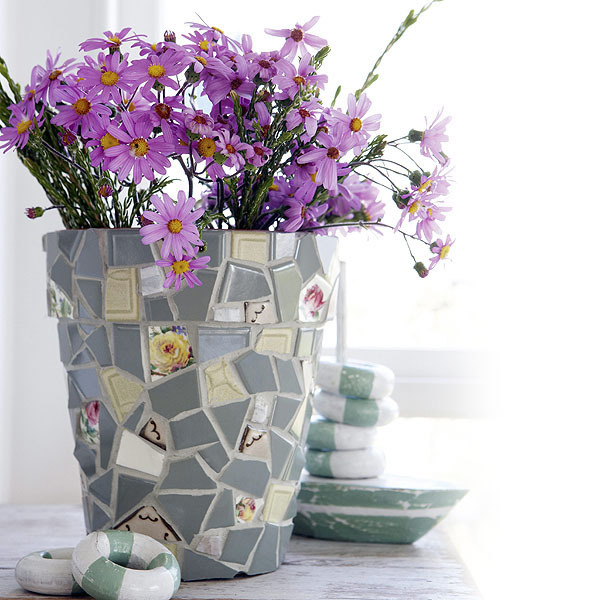 Alongside the ceramic mosaic style, these glass chips can be used to create whatever image you might want displayed on a flower pot! In this example, a cat sits peacefully beside a butterfly. The possibilities for what you can do with the mosaic style are endless as long as you have an imagination and a will to create something special! 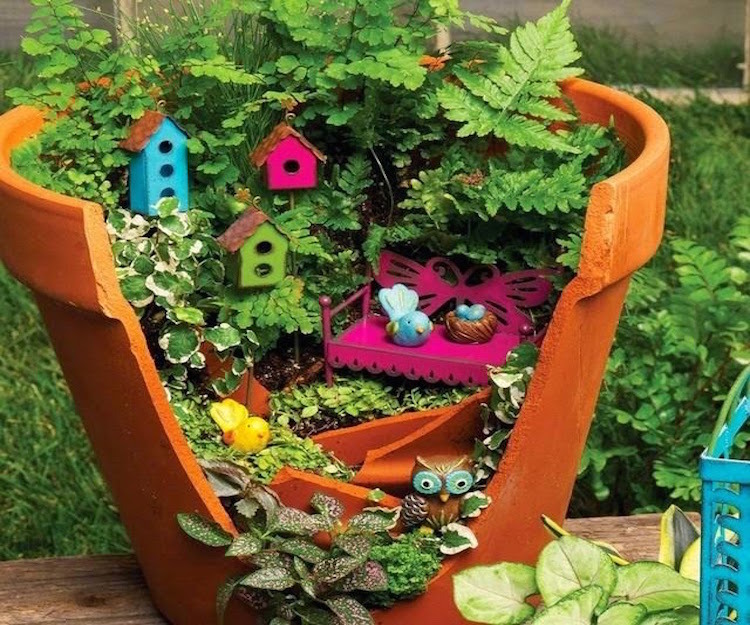 Another way to use a broken pot is to turn it into a small utopia! 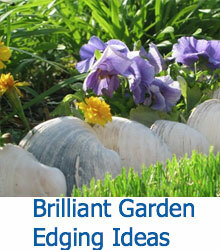 This is a great way to incorporate tiny decorations into your garden that would otherwise go unnoticed. This way, the flower pot draws attention, the fact that it is broken sparks an interest, and the rest is up to you in regards to what you put inside! This is another great design for those that love the forest! This pot is covered in small slices from a tree limb, creating a unique and original design that you really don’t see all the time. Use different sized cuts of wood or cuts from different types of trees to add your own twist to this design. A little glue and a lot of hemp rope can go a long way! 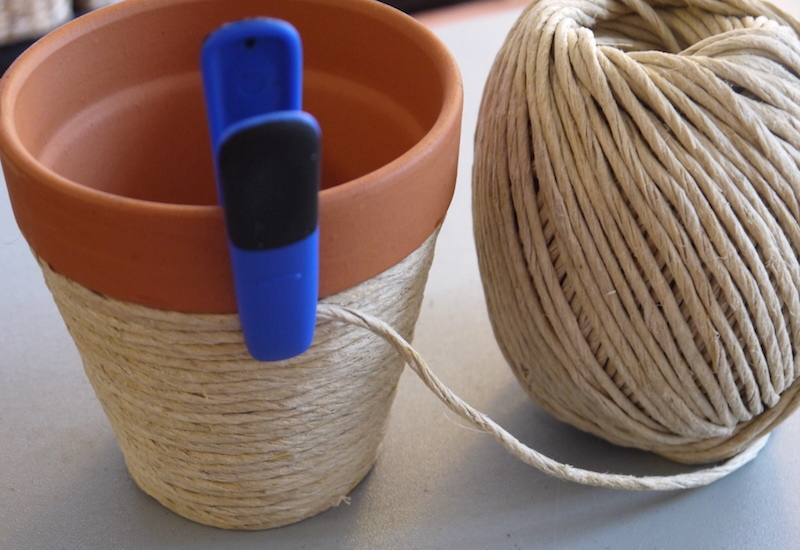 One of the simplest and cheapest designs, this uses basic hemp rope wrapped tightly around the outer surface of the pot to create a special look. Incorporate beads or other small decorations and wrap them up within the rope to get a more personalized design. 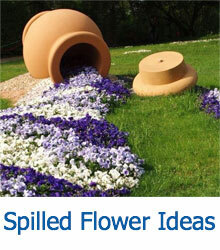 A gardener can never be afraid to get messy, and you certainly can’t be if you want to try this design! 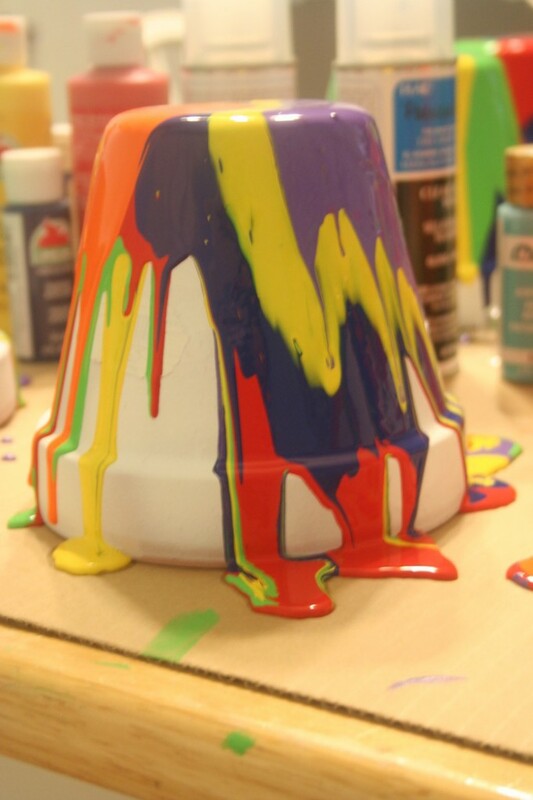 Use an excess amount of paint and pour it over the bottom of an overturned pot to create a rainbow of mixing colors. This is a great idea if you are looking for a project to do with kids.